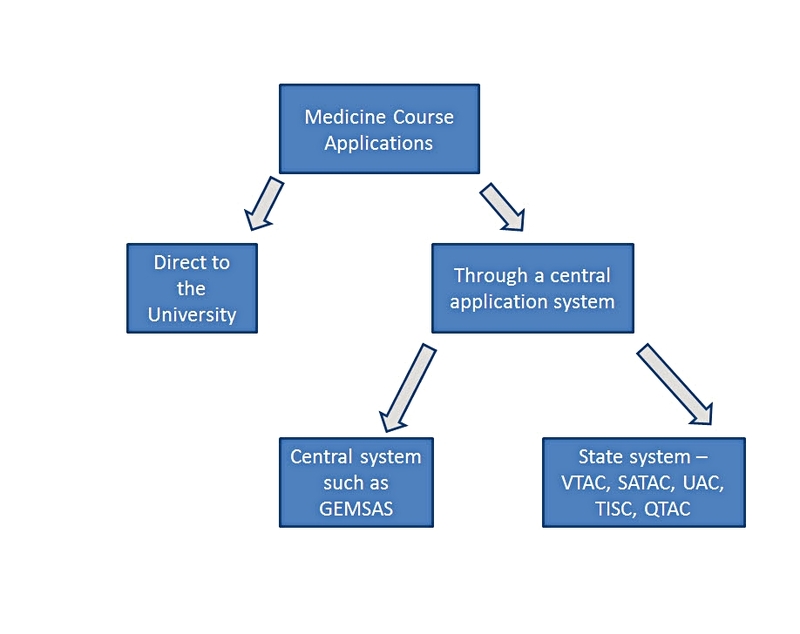 If you want to apply for medicine you need to do so through the application system applicable for that degree. The key thing to realise is this means you will need to put in multiple applications (through different application systems) if you're wanting to apply for a number of medicine degrees or degrees leading to medicine around Australia. in terms of the specific requirements that apply - ie. whether you're a domestic student, if you're an international student, are you applying for a particular type of place such as a rural placement etc. as well as understand any other particular aspects that apply for entry to that degree (such as subject prerequisites, special or additional application requirements such as UMAT etc). there are get out of jail cards if you don't complete the online application by the 27 September deadline. 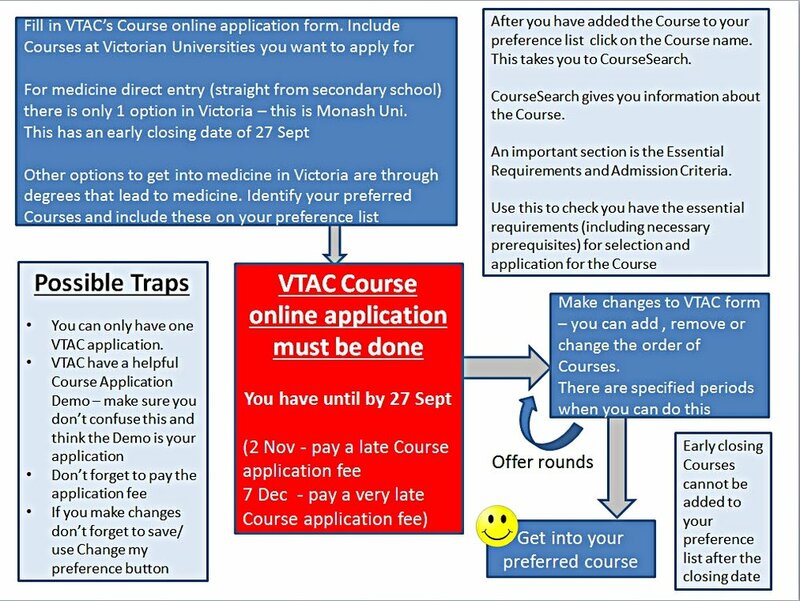 By paying late application fees you can still lodge an online application with VTAC by certain dates. Monash's direct entry (undergraduate) medicine degrees have an early closing date of 27 September. This basically means if you miss VTAC's online application date of 27 September, even if you put in a late VTAC online application, you still won't be able to apply for Monash undergraduate medicine because Monash's undergraduate medicine degree applications will have closed and therefore can't be added into your preference list. And why should you care - if you're not from Victoria? for each degree you are interested in applying for. There's a lot to work through. So the thing to do is start early, work out the degrees you are interested in, do your homework and put in applications. In Study Medicine check out the deadline section and you can also find application information for each university. This is under Details in the navigation tab - for each university. You can also see how this works by going to Macquarie trial Details with application information provided in the detailed table. There is also helpful information information provided by sources such as VTAC, UAC etc as well as information provided by universities directly - so get to it and start applying. Study Medicine information has been compiled from Australian university and other information sources and therefore is a guide only. Authoritative information is only provided by Universities and other sources such as VTAC etc. Make sure you obtain information directly from these organisations before making any decisions. Just imagine tomorrow, there’s the announcement the ATAR will now solely be determined by your ability to play a single sport. We always knew Australia was sports mad. Now we have proof. Not only have we recognised that sport is singularly the most important aspect of Australian life, we have now institutionalised it - in terms of how students are accepted into tertiary studies. Your ATAR will from now on be determined based on how good a sports player you are compared with all other students in Australia. At your school you have the choice of playing either volleyball, hockey, soccer or table tennis. You’re determined to become a doctor and you know you need to get a high ATAR to be accepted into a medical degree at university. to get a top ATAR you need to play the game you’re best at – so you choose volleyball. You also understand to get the highest ATAR you have to be the best player compared to other players. · but also your ranking overall against all the other students playing any sport – regardless of whether they are playing volleyball, or badminton (which other schools play but isn’t offered at your school), football, hockey, golf, lacrosse etc. So - not only do you need to be the best volleyball player, you also need to be the best player - period. This is because you are being compared to all other players no matter what sport, in being judged the best player. So it goes without saying that you’re going to choose volleyball – because you’re complete rubbish at soccer, you can’t run to save yourself so hockey’s out and you need reflexes like a cat for table tennis. Easy – volleyball it is. The next question though is tough. Volleyball has different grades and you now have to consider whether you want to compete in A Grade volleyball, B Grade or C Grade volleyball. How do the different grades of volleyball influence your ability to be ranked the best sports player of students in Australia? You know you’re reasonable volleyball player but you’re not a superstar – so which grade? The answer is based on thinking through where are you likely to be ranked against other players playing each grade of volleyball. Sport in Australia is nothing without statistics – so you go and look up the information. What do the curves say about how well you have to go as a player to get the best scaled ATAR mark? If you choose to go into C Grade volleyball you need to be the absolute best – ranked at the top 99th percentile of all volleyball players (top 1%) to get a scaled ATAR mark of 45. If you’re average (at the 50th percentile) which means you out-perform 50% of other C Grade volleyball players you will get a scaled ATAR mark of 22. If, however, you choose A Grade volleyball, you only need to be in the 50th percentile (top 50%) of all volleyball players to get the same study score of 45 as you would if you were the top volleyball C Grade player. Hmmm, tough. A Grade is after all a lot harder than C Grade. So think carefully about which grade you want to compete in because it’s all about how well you go against other players that determines whether you will get the scaled ATAR mark you need to get into university. So this raises the question what’s the point of scoring games and how does this relate to your scaled ATAR mark? Volleyball, hockey, soccer and table tennis are all scored. How otherwise would you work out which teams have won which games? can be compared and ranked against each other as indicated by their scaled ATAR mark. So what is ATAR scaling and how does it relate to your ATAR score? In this example and to continue the analogy, different sports have different scoring systems so it’s not possible to compare a score in a soccer game with an AFL football score as they are on different scales. To compare these scores need to be adjusted, not only to have the same assessment but also to ensure all players are able to be compared regardless of what sport they play and the team they play for. The ATAR is the assessment of how you as a player are ranked against other players - not influenced by the sport you play or the team you play for. Scaling is used to make sure the assessment is on an equal basis. So it’s not whether a soccer score is scaled more than a table tennis score. Decide which subjects you want to do based on what you are interested in and what you are good at. There’s no point in choosing to play soccer based on the understanding the score is significantly scaled, if you have no soccer playing ability. Make sure you work out which university degrees you want to apply for and from this determine the required prerequisites subjects. · likely to be the top ranked player in a lower level grade? · a mediocre player in a higher level grade? · in each case what is the likely scaled mark you might achieve? It’s not about whether or not a subject is scaled, it’s all about studying something you are good at and your level of competitiveness in doing that.